Winter 2019 has officially arrived, and although we have yet to experience those famous bone-chilling Hudson Valley-area temps, heating season is in full swing (and you have the heating bills to prove it!). Optimize your thermostat settings – Drop temperatures by 7 to 10 degrees for eight hours a day (when no one is home, or when people are asleep, for example) and you will save yourself about 10 percent on your bills with no loss in comfort, according to the U.S. Department of Energy (D.O.E.). You can expect similar savings if you drop the overall temperature in your house by 3 to 4 degrees throughout the day (a good target temperature when people are home is about 68 degrees, says the D.O.E. Close vents and doors in unused rooms – Why pay to heat rooms that no one is using? Close them up, or use zone controls or supplemental space heaters to “spend” your heat more practically. Reverse your ceiling fans – If the blades of your ceiling fan are spinning in the right direction, they will push rising warm air back down and into your room. Most ceiling fans have a reversal switch to change their spin; see your owner’s manual for details. Take advantage of the sun – Leave windows uncovered during the day to soak up free solar heat, then cover them at night with heavy, insulating curtains to keep that heat in. Weatherize – The average American home leaks the equivalent of an open window’s worth of air through leaks around doors, windows, and other hard-to-see places. Air leaks force your heating system to overwork to keep you comfortable – which means you will pay more to heat your home and spend more on maintenance for your equipment, too. Inexpensive measures like caulk, weather sealing, and door sweeps are effective ways to keep warm air in and cold air out (you can read up on some D.O.E. air sealing tips here). Service your heating equipment – Your furnace or boiler loses an average of about five percent efficiency each year if it is not properly maintained, so make sure to get your heating equipment serviced every year. Consider sensible heating equipment upgrades – Even a well maintained furnace or boiler can’t compete with today’s high efficiency heating equipment when it comes to keeping you warm for less money. In fact, you could save as much as 30 percent on your annual fuel costs when swap your older heating system for a new model – enough to offset the cost of a new heating unit in just a few years. Want more ways to save on heating bills this winter? We can help! 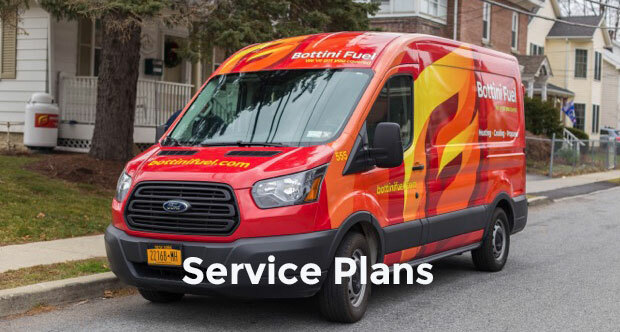 Contact Bottini today for the best heating equipment service and most reliable propane and heating oil deliveries in the Hudson Valley area.